One of the great things about the theater is that it can dramatize history, and the people who make it and shake it. Actual events can be given shape and form when expressed in the theatrical medium. 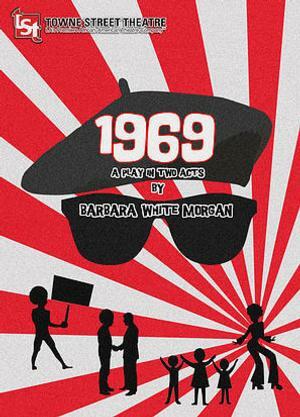 Playwright Barbara White Morgan attempts to do this by taking on the heady late Sixties, when revolution was in the year, with the Towne Street Theater world premiere production of 1969. Ajamu (Jaimyon Parker) wears the era’s obligatory uniform of black leather jacket, shades (even indoors and at night) and Afro, which were de rigueur for the period’s Black militants. His comrade, Lewis (Lamar Usher) also even dons a beret. Ajamu is the leader of the Afrocentric Blacks United group, which occupies a building that the city government, led by City Councilman Ernest Butler (Kenny Cooper), wants to redevelop and turn into a youth center. This sets the two — both African American but from different sides of the ideological tracks — on a collision course. 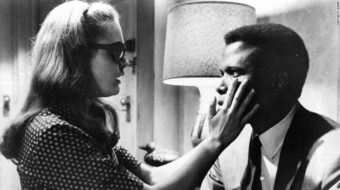 In doing so, this two-acter directed by Kim Harrington poses and dramatizes questions that were very much in the air circa 1969. How will the oppressed advance and attain liberation? 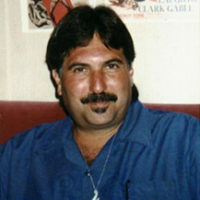 By staying within the system or by straying outside of the prevailing established ways of doing things? In Morgan’s play, integration collides with Black nationalism, nonviolence with militancy, Civil Rights with Black power, the ballot with the bullet. While Blacks United is a fictional group, it seems like a synthesis of, or suggested by, actual organizations, such as the Philadelphia-based MOVE and the Black Panthers (although the latter actually considered themselves Marxists, not what Huey Newton and Bobby Seale mocked as “pork chop nationalists”). Indeed, the staged standoff at the Blacks United headquarters calls to mind the similar impasse at MOVE’s HQ, which resulted in the U.S. government’s only domestic aerial firebombing of the 20th century. In any case, SNCC (the Student Nonviolent Coordinating Committee) is also alluded to, while Ajamu seems like a composite character composed of Stokely Carmichael, H. Rap Brown, Huey, etc. The earnest Ernest believes in more incremental change through the electoral process, and seems emblematic of the wave of African American politicians who attained office in the wake of the Civil Rights movement and the Voting Rights Act, which saw the late Sixties elections of Carl Stokes and Richard Hatcher as the Black mayors of Cleveland and Gary. 1969 ponders whether these changes at the top will engender true Black empowerment — or the creation of a new African American establishment. The fact that the drama’s city councilman’s last name is “Butler” — long a stereotypical and subservient role for Blacks — may indicate where Morgan stands on that issue. Megan Weaver is fetching as Ernest’s wife, Grace Butler. Has the city councilman’s wife, with her Afro wigs and fur coat, gone bourgie? Grace’s (presumably) younger, less together sister Edna (Lina Green, who has an expressive face and appeared in Adam Sandler’s Jack and Jill) is trying to pull herself together. As 1969 was rather famously also when Woodstock took place, no play about that year would be complete without a flower child, and Samantha Clay has some scene stealing fun as the stoned-out hippie Joyce, which displays her background with the Groundlings improv troupe. In a double role she also plays Mayor Evans’ (Jonathan Harrison) conventional wife Sylvia, who may well be the flip side of her countercultural alter ego. Another white actor, Andy Ottenweller, portrays Dave Epstein, radical host of a talk show in, perhaps, the David Susskind mode (although Epstein’s Dave is hipper, younger and to the liberal Susskind’s left), who sympathizes with Ajamu and his cause. All of the elements are here for a combustible concoction set against the background of the sizzling Sixties. Alas, this Molotov cocktail never explodes. Although I was intellectually absorbed by 1969, it rarely became emotionally engaging, even when high stakes were being played. Perhaps this was due to the acting, directing, or maybe the writing — or perhaps all three? For one thing, the staging is a bit repetitious. The play’s credits do not list a set designer per se, and it shows, considering the very standard artwork that decorates the Butlers’ apartment (although it may be meant to cleverly reveal the couple’s being divided between their Black sides and the bland middle class values they seem to aspire to). In any case, this is supposed to be live theater, not a pamphlet or leaflet. Perhaps next stop for TST’s 1969 is Ferguson? 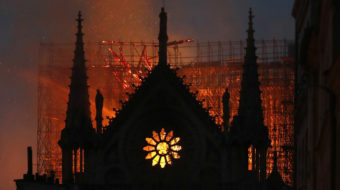 The fire next time!